There are 5 reviews of Oud Save The King. Smoke, oud, tobacco, tea, suede and iris, combined in a decent way. It's classy and elegant but not to harsh or oppulent. The dark notes remind me of Laudano Nero but not that much. A good perfume but the price is to high. Not to mention the bottle is a total kitsch. Not my style. I have no objection to oud, but I couldn't really find it here. What I did find was a soft, sweet leather -- the suede. And then a creamy vanilla note which I suppose is meant to be sandalwood. I find the scent much too sweet and one-dimensional. Its sweetness becomes cloying and quite irritating for me. Oud Save The King (urgh, that name...) starts off with a complicated mix of fruit and pipe tobacco and ashy woods that reminds me of Ambre Narguile, but with just a pinch of rubbery oud added. Given a little time, the fruits and ash fade to the background, leaving an interplay of pie spices and smoky rubbery wood that reminds me of Tom Ford's Oud Wood. As the day progresses, some rounded sandalwood mixed with marshmallowy vanilla wells up from the bottom, ending up as a mix of forest greens and woods with sweet candied vanilla, which reminds me of the drydown of Creed's Royal Oud. From a technical standpoint, I'm kind of amazed that they pulled this off. This covers a lot of ground and does it extremely well. From an artistic standpoint, this feels more like a megamix of hits than an original composition, but it's done so deftly that I don't really care. Thumbs up! What a neat trick – in Oud Save the King, the perfumer takes the tried-and-tested winning suede and orris accord (see ELdO’s Tom of Finland for example) which is known to nuzzle the daylights out of the wearer and added a subtle oud accent. That’s about it, but the combination is like a chef’s slight twist on a traditional recipe that has the diners queuing up for more. Oud Save the King is a crowd pleaser, no doubt about it – but in this case I’ll happily join that crowd. Goes in a sweet woody direction in the deep drydown, but remains warm and indulgent. I tried this one in Barney's department store in Beverly Hills recently. I bought something else and the sales assistant recommended I try it; I loved it right away and took a tester strip back to my hotel, and it was still radiating gorgeous notes two days later, which made me think there must be some high quality ingredients in here. I bought a 100ml bottle when I got home - here are my thoughts. First, the name. Oud Save the King. It's TERRIBLE. 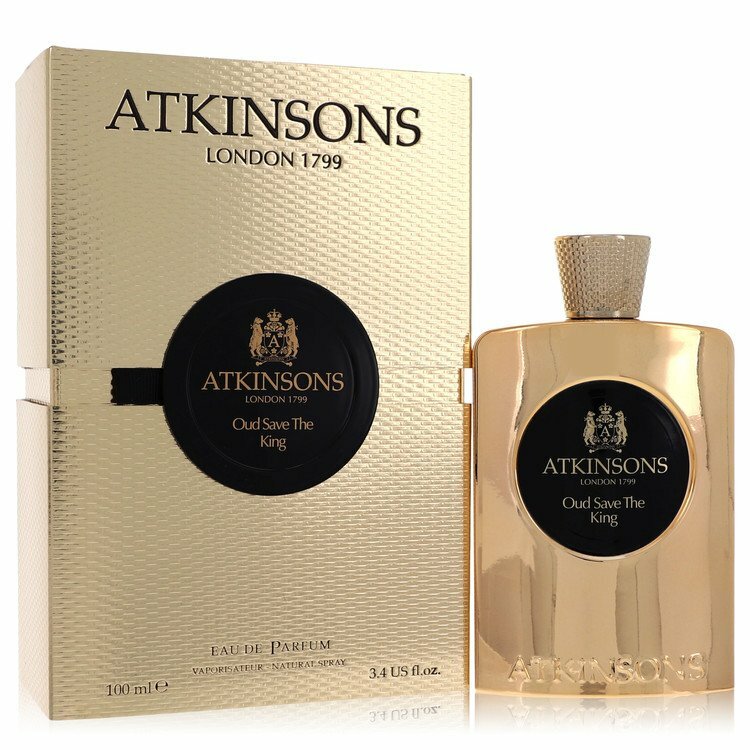 Okay, Atkinsons is an English brand, and our national anthem is God Save the King/God Save the Queen (according to the reigning monarch of the time), and there are two lines in this fragrance range (Oud Save the King for men, Oud Save the Queen for women). But simply replacing the word "God" with "Oud" does not create a pun or a witticism; it's got nothing to do with anything, and it seems contrived and naff to my ears at least. The packaging is a bit strange as well, with a lurid textured shiny gold cardboard box featuring a black fabric tag with which to pull open the inner case - the bottle itself a bit better, covered as it is in the same burnished gold reflective material, this time without the textured effect featured on the box. The front of the bottle is smoothly curved and the back has a series of angles which makes it nice to hold. The lid is hefty and comes on and off with a satisfyingly positive click; it's textured to match the outer card box, and it looks very smart, even though the overall effect is a bit "bling" (and therefore "cheap") for my tastes. The bottle taken as a whole looks like a gold hip flask, I suppose. Anyway, enough with the visuals, what about the scent? It's TERRIFIC. It's unlike pretty much any fragrance I've ever encountered, and certainly very different from the mass brands. It opens with notes of Earl Grey tea and a smooth bergamot, but rather than being sharp and citrussy, those two top notes are wrapped around a sultry, leathery/smoky centre which is immediately apparent. There's citriol and leather (specified as "suede" in the official scent notes from Atkinsons) blended with cedarwood, gurjun balm and guiac wood. There is, as far as I can tell, no oud in Oud Save the King, which makes the name even more baffling. Despite that, it's a gorgeous, very classy fragrance, sultry and sinuous, with plenty of projection power. It's fairly linear throughout its life and doesn't descend into powderiness in the dry down. The overall effect is of a warm, sensuous, slightly smoky dark woody scent with unusual hints of lime, but a smooth, silky lime rather than a sharp hit of citrus. Hard to describe, wonderful to experience. Definitely recommended if you can find it. There are no member images of Oud Save The King yet. Why not be the first? Oud Save the King by Atkinsons... Anyone try this one yet?